PowerApps local User Groups are in-person quarterly meetings that are open to PowerApps users. 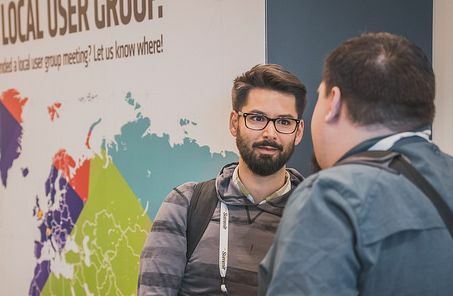 Local User Groups are hosted by User Group volunteers (people just like you who have opted to get more involved) and are meant to foster peer to peer collaboration and knowledge sharing. With each meeting, leaders and attendees alike share best practices, practical takeaways, and real-world success stories. PowerApps local User Groups help product users find efficiencies and productivity, giving them a professional edge. With over 50 local User Groups across the world, it is our goal to provide access and support to as many users as possible. Meet other PowerApps users who work near you, and even those in similar roles to share best practices, tips and tricks, and build your support network. Local User Groups exist today as a way for you, the PowerApps end-user, to connect with others in your area using the same technology to run, manage and stay active in your business. The knowledge share that organically happens during these local meet ups is the change agent many are looking for to help positively impact their business. Create your free user group account and explore your active local User Group community. Register for local meetings and connect with others in your area. This is the official Belgium PowerApps User Group. Our aim is to build, educate and grow the local PowerApps community by organising educational events and enable collaboration between us. It is a place to help, to learn, and to gather PowerApps users in one single place allowing you to connect with other professionals from the same country and all over the world, to keep you up to date with tips, tricks and more. The Bremen & Hannover PowerApps and Flow User Group is a place to help, to learn about PowerApps and Microsoft Flow, to gather PowerApps and Flow users in one single place allowing you to connect with other professionals from the same country and all over the world, to keep you up to date with releases, tips, tricks and more. Our aim is to create a community within Northern Germany that will help members grow their knowledge, network and experience with all components of PowerApps and Flow. Meetings will alternate between Bremen and Hannover. Welcome to the Czech and Slovakia PowerApps and Flow User Group. Feel free to share everything that relates to Microsoft Power Platform, especially PowerApps or Flow. Lets create better work with help of PowerApps and Flow. Welcome to the Danish PowerApps and Flow User Group, the place to share knowledge, experience, and passion for the Power Platform solutions. Dubai Power BI & PowerApps User Group will focus on exploring the capabilities of Microsoft Power BI & PowerApps for all Dubai based data users. Power BI provides interactive visualizations with self-service business intelligence capabilities, where end users can analyze data, create reports and dashboards and get insight by themselves, without having to depend on any information technology staff or database administrator. Whether you are a finance, marketing, HR, operations or any other industry professional or a small medium business owner, we welcome you to join the group. This group will serve as a community for members to learn, share and grow their skills in Power BI & PowerApps and will provide opportunities to meet subject matter experts in Power BI & PowerApps. BE SMART AND BE HAPPY in this smart and happiest city Dubai! This local user group brings passionate PowerApps and Flow users together to share, learn and grow their skills and opportunities. Come and share best practices, learn the latest features, connect with other PowerApps and Flow enthusiasts, and have FUN! Start a PowerApps User Group in Your Area! People are passionate about PowerApps and they want to share and learn from each other. Local User Groups are a great way to network, grow your skills, discover opportunities and have FUN. Starting a group is an excellent way to exercise your leadership skills and gain extra perks as a User Group Leader.